I remember another thud as my stubborn feet disregarded the instruction and tried for another uncoordinated escape, which went about as well as the first. My brain opted for another round of unconsciousness. 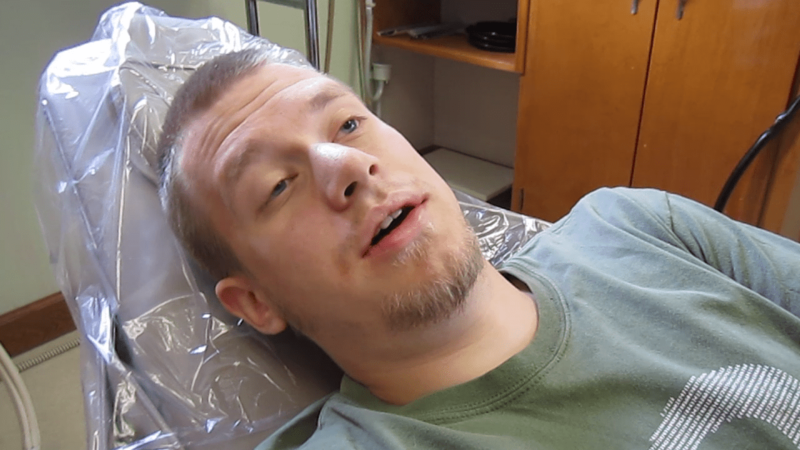 When I came to again, my soon-to-be-wife was beside me, and it occurred to me I had come to the dentist’s office to have my wisdom teeth removed. “Ih ih owheh?” I asked as only a thoroughly drugged man with several sheets of gauze in his mouth can. I spent the next small eternity trying to carry on a conversation and get out of the chair. I can clearly remember being frustrated because, while I didn’t feel hindered in terms of perception, I couldn’t get my body coordinated enough to outrun a narcoleptic snail. Later, when my mind was a little less muddled, Mary and I were laughing about the whole experience, and it reminded us of a handful of scriptures that I can now relate to on an entirely new level. For instance, Christ warned his disciples, “Watch and pray, lest you enter into temptation. The spirit indeed is willing, but the flesh is weak” (Mark 14:38). How often do we find ourselves in a spiritual condition similar to what I experienced in the dentist’s chair? We know in our minds exactly what it is we want to do—what sins we want to overcome, what good habits we want to cultivate, what kind of a relationship we want to build with God and with others—but despite our determination, we spiritually remain sluggish and uncoordinated. For all our good intentions, we fail to make any real progress. Paul, a veteran of the Christian lifestyle, knew this feeling all too well. He wrote in one epistle, “For what I am doing, I do not understand. For what I will to do, that I do not practice; but what I hate, that I do… O wretched man that I am! Who will deliver me from this body of death?” (Romans 7:15, 24). Waking up in the dentist’s office, I felt like I was learning how to use my body all over again. Nothing came naturally, and it took great effort to turn my head, move my arms and even open my eyes. Likewise we, as Christians, are learning how to control an entirely new sort of body—not our old, familiar physical ones, but spiritual ones that operate completely differently. Though we won’t actually receive that body until sometime in the future (see 1 Corinthians 15:42-44), we are being trained now to use it to its full potential. Like children learning to walk, we will spend a lot of time stumbling as we learn to operate on spiritual principles that don’t come naturally to our carnal minds. The important thing is not that we fall, but that when we fall, we get back to our feet. The Bible records, “For a righteous man may fall seven times, and rise again” (Proverbs 24:16). We’re learning to live in a way that comes anything but natural to us—but we’re being taught by a God who wants nothing more than to see us succeed. So as we struggle to stand, to walk, to do the things that come so naturally in a physical sense, remember this promise: “Beloved, now we are children of God; and it has not yet been revealed what we shall be, but we know that when He is revealed, we shall be like Him, for we shall see Him as He is” (1 John 3:2). Isn’t that worth stumbling toward?